My friend, Shannon, has been telling me for years that she would like an angel because she saw my L&L angels hanging in my house. I finally told her I would stitch her one this year. I told her to look on the L&L and Mirabilia sites. Well, she chose Titania, Queen of the Fairies. 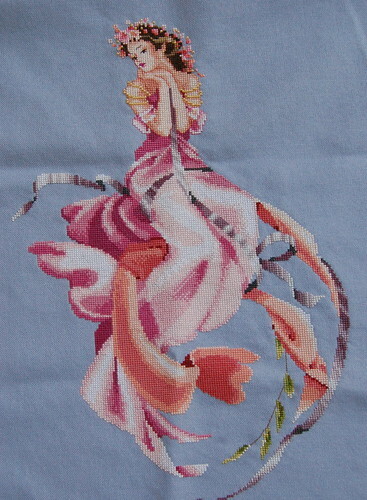 I had actually already stitched this one except for the wings and leaves. I told her I would finish it up and give it to her hopefully for her birthday in September. I got her back out last night and started on the leaves. There are a lot of color changes in the those leaves, but it wasn't too bad. 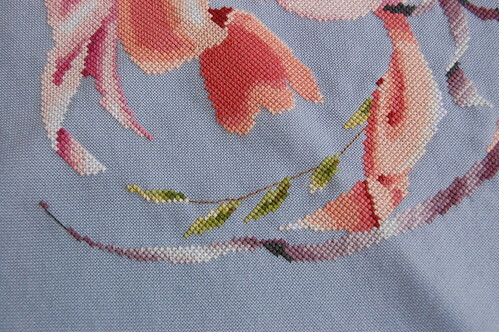 I plan to stitch this at least one day a week to get it done by September. I'm going to get back to Kind Fond Love today. Write soon! Wow Titania is gorgeous! I like the colors of it too! Titania is wonderful. How spooky is it that your friend liked what you had already stitched! She will be a lovely generous gift for your friend. She is SO pretty! What a nice thing to do for your friend--she will LOVE it! Gorgeous piece. Darn I need a friend like you to stitch me one..LOL!!! This just beautiful! I didn't realize you had stitched several of the faires but they really are very pretty! It is great that she chose something you have so much done on too! Beautiful colors!!!! It will make a wonderful gift!! Wow what a stunning piece. Lucky friend. Hey great blog look...by the way! It will be a lovely gift. I have a few of those L&Ls and Mirabilias that I really need to pull out and finish too! Wow! The fairy design is gorgeous! I would love to start a Mirabilia design one day, but I'm trying to finish up my Elements sampler! As always, your stitching is breathtaking. I am sure your friend is going to love the design when it is finished and framed! It's so gorgeous! Your friend will just love it. Wow, this will be a great gift for your friend. Titania is so pretty and your stitching is just wonderful - the friend will be very happy and lucky to get the piece as a gift. I love the fabric you chose for Titania! Can you recall what fabby it is? I've got this chart, and seeing yours has spurred me into action to get my hand on some of the same linen you used for yours. You are such a sweetie for finishing her for your friend. I hope you get to feeling better really soon.